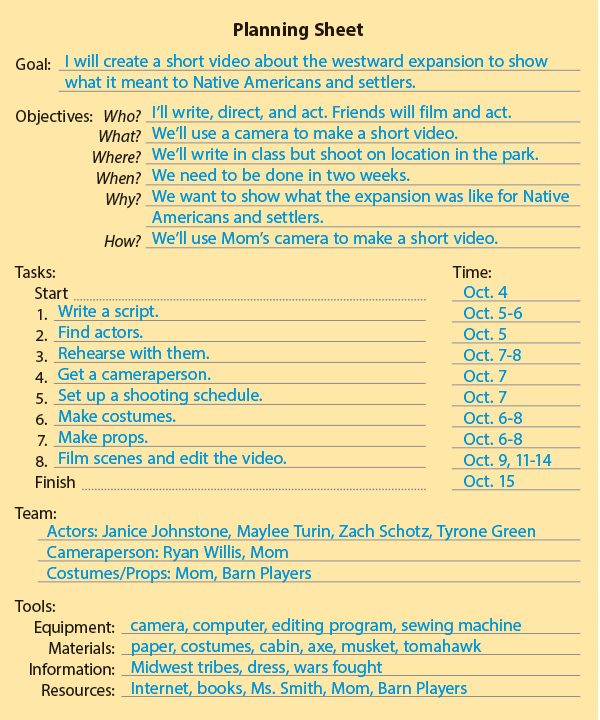 Your Turn Create your own planning sheet for a project that you need to complete. Download the blank planning sheet at the bottom of this minilesson. Fill it out step by step. Goal: In one or two sentences, tell what your project is supposed to do and why. Objectives: Answer each of the 5 W's and H questions about the project: Who? What? Where? When? Why? and How? Tasks: List in order the tasks that you need to do to complete the project. Time: For each task, list a time when you want that task to be completed. Team: Write down who will do what tasks. Tools: List the equipment, materials, information, and resources you will use. Creating a Plan by Thoughtful Learning is licensed under a Creative Commons Attribution-NonCommercial-ShareAlike 4.0 International License. Based on a work at k12.thoughtfullearning.com/minilesson/creating-plan.